Bose-Einstein condensates made in space could provide a new tool for detecting gravitational waves. 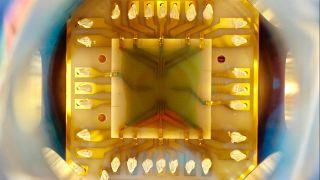 For the Matter-Wave Interferometry in Microgravity experiment (MAIUS-1) experiment, a team of German researchers used this atom chip to create Bose-Einstein condensates in space. By launching a tiny, atom-packed chip into space and blasting it with lasers, German scientists have for the first time created an exotic state of matter known as a Bose-Einstein condensate in space. Their findings could lay the groundwork for a new way to search for gravitational waves, or ripples in space-time. The Matter-Wave Interferometry in Microgravity experiment (MAIUS-1) launched on a sounding rocket from the Esrange Space Center in Sweden on Jan. 23, 2017. Not only did the mission succeed in creating the first space-based Bose-Einstein condensate, but the researchers also did more than 100 experiments with this sample during the 6-minute spaceflight. Results from the study were published today (Oct. 17) in the journal Nature. This phenomenon is the result of a quantum mechanics principle known as wave-particle duality, which says that light and matter exhibit properties of both particles and waves. A particle's wavelength is directly related to its temperature. Particles with higher energies exhibit shorter wavelengths, while those with low energies have longer wavelengths. By cooling a group of atoms until they all occupy the same low-energy state, their wavelengths stretch across the entire atomic cloud and become identical. To make the atoms as cold as possible, scientists use a method called "laser cooling." When a laser beam blasts a photon (or a particle of light) at an atom, the photon gets absorbed by the atom and reduces its momentum in the process. That's because those photons have their own momentum to begin with, and when an atom absorbs a photon, it also absorbs the photon's momentum. In a head-on collision, this causes the atom to lose momentum, or slow down. The slower the atoms are moving, the lower the temperature will be. During the MAIUS mission, a sample of rubidium atoms was cooled to create the first BEC in space. But perhaps even more exciting than this historic first were the results of experiments the researchers did with the BEC, which showed that it may be possible to measure gravitational waves in space with more precision than is done on Earth. Engineers with the MAIUS-1 experiment load payloads onto the sounding rocket. The discovery of gravitational waves at the ground-based Laser Interferometer Gravitational-Wave Observatory (LIGO) in Louisiana earned three physicists a Nobel Prize in 2017. BECs in space could help boost the hunt for gravitational waves. With space-based measurements, "we could in principle set up a gravitational-wave detector using atom interferometry that is sensitive to other frequencies than LIGO," Maike Lachmann, a researcher at Leibniz University in Hanover, Germany, and one of the lead researchers for the MAIUS experiment, told Space.com. Using a device known as an atom interferometer, the researchers used laser beams to split the matter waves in two, then recombined the waves in a way that creates an interference pattern. When the atoms are in "freefall," or a microgravity environment, the measurements "are sensitive to inertial forces, like the gravitational field," Lachmann said. "The sensitivity scales quadratically with the time the BEC spends in the interferometer," Lachmann said, adding that when doing this kind of experiment on Earth "you always have the problem that the BEC crashes to the ground after a short time … In space you have microgravity conditions, so it can in principle be observed as long as you want." This new research "paves the way for quantum sensors in space that could be used to conduct experiments that are not possible on Earth," Liang Liu, a researcher at the Chinese Academy of Sciences in Shanghai who was not involved in the study, wrote in an accompanying Nature News & Views article. "Examples include detecting gravitational waves in a frequency range that is not usually accessible, sensing possible ultralight dark-matter particles and observing subtle effects associated with Einstein's general theory of relativity. Who knows what mysteries of the universe could be revealed by spaceborne quantum sensors." Before scientists could perform this experiment in space, they first had to find a way to miniaturize the scientific equipment needed to produce BECs. "Normally, such a device fills a whole laboratory room," Stephan Seidel, a co-author at the University of Hanover, said in a statement. "Designing a system so compact and robust that it can fly on a sounding rocket has been a major challenge for scientists and engineers." The sounding rocket stands only about 8.2 feet (2.5 meters) tall and measures 20 inches (0.5 m) in diameter. Since the MAIUS mission launched, a similar experiment known as the Cold Atom Laboratory has been sent to the International Space Station. The Cold Atom Laboratory, which launched to the space station in May, has since created BECs by cooling a cloud of rubidium atoms, much like the MAIUS mission. Rubidium is "one of the easiest atomic species to cool the cloud down until condensation," Lachmann said, "but it is of course possible to do this with other species. For the next two MAIUS-missions (MAIUS-2 and -3) we will add Potassium-41 as a second species." Those missions will launch sometime in 2018 and 2019.